Each September through October Neighborly Heating & Cooling Service, LLC offers a furnace cleaning and operational check for only $69.95. The $69.95 also counts as a full service fee, so your furnace is covered for the entire heating season (see Service Fee / Cost for a full explanation). Though unfortunate, many homeowners never even think about their furnace or air conditioner until it stops working. A great percentage of those breakdowns can be attributed to a simple lack of maintenance. For instance, it is not a good idea to let dust and debris build up in your furnace or on the air conditioning condensing unit. Just like an automobile, your heating and cooling equipment needs attention to keep it operating properly and efficiently. Furnaces and air conditioners were never designed to be installed and then forgotten. Having your furnace and air conditioner cleaned and checked annually is simply an inexpensive and good idea, additionally it may help to enhance your equipment’s operational life. What can a home owner do to help maintain their equipment? Change the air filter. This is true for both the heating and cooling seasons. 1 inch wide air filters should be checked every 4 weeks and replaced if they look grey or have a layer of dust. 3-4-5 inch wide air filters typically only need to be replaced annually, refer to the manufacturer’s recommendations. Look at the furnace. If there is dust on the outside of the unit, chances are there is even more dust on the inside. Dust and debris build-up can cause burner and pilot problems such as “delayed combustion” (a small explosion) within the furnace as it is attempting to ignite. This can be dangerous. It is probably best to have your furnace professionally cleaned. Check the air conditioning condensing unit. Look at the outdoor unit, if there is debris build-up on the outside of the fins you can use a garden hose to rinse it off. Do not use pressure washers or air compressors as you may bend or damage the fins. 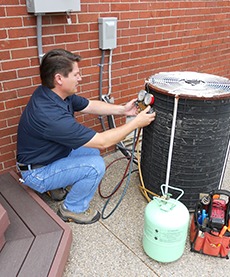 Keep bushes or plantings trimmed back away from the condenser unit so as not to hinder air flow around the unit. Do not pile garden hoses or other items on top of the unit as this will also hinder air flow. Keep your ears and eyes tuned-in to your equipment. If the equipment begins to make odd noises or appears to be doing something strange, shut down the equipment and call a professional immediately. Many times you can prevent further damage with this simple act. If you do not feel comfortable performing these types of maintenance tasks, or if you need further explanation so you can perform the maintenance yourself, then please call and schedule an appointment. Neighborly will be more than happy to service your equipment for you, or to demonstrate how you can maintain it yourself. A qualified professional will always be able to take a more in-depth look at the equipment and provide added insight as to possible hidden problems, and how to possibly prevent potential breakdowns. Neighborly Heating & Cooling Service, LLC is fully licensed and insured. Call us to schedule an HVAC maintenance appointment. Copyright © Neighborly Heating & Cooling Service, LLC, 2016. All rights reserved. We only service residential customers.